The video chat pioneers from Fring announced that they have a new service to offer - group video chat - for iOS and Android. The buyout of Qik by Skype has been taking all the attention lately in the chat arena, but Fring doesn't stop innovating, too. 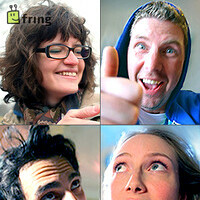 You can now do video chat with up to three other people for free over Wi-Fi, or your carrier's data network. The folks from Fring recommend at least a 1GHz mobile processor for the smoothest experience with their DVQ (Dynamic Video Quality) technology. With Fring you can, of course, also call regular phones via fringOut credits, and the service can be used for in-app messaging, too. Have a look at the wonders of four-way video chat in the promo below.